My first exposure to the band Minibar was at the Pete Yorn concert at 8150 a week ago. I thought they were a perfect fit as an opener to Yorns’ heartfelt storyteller-style songs. 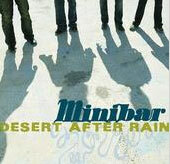 Minibar presented the energy of a rock band that actually enjoys playing their music to crowds and hasn’t yet been worn down by the brutal machinery of a for-profit industry. My curiosity was aroused and I checked out their third studio album “Desert After Rain” that was just released independently by the band. First, a little history: Minibar is Simon Petty, Sid Jordan, Tim Walker and Malcom Cross. They got started in London in the mid-90s and have since gone on to Santa Monica, California to find a following in the States. Listening to their sound, you would never be able to guess that these guys are Brits. Their sensible guitar pop sound has an organic appeal to it that reminds me of bands you would come closer to hearing in the Midwest, rather than some of the Euro-indie stuff that is being manufactured by most bands today. From start to finish, “Desert” is full of honestly delivered lyrics that speak of ghosts of the past and coming to grips with the present world we can’t always control or predict. Like the chorus of the opening track “Things I Left Behind”: Don’t try to change what the truth is/Traces remain in my mind/I hope you find some kind of use/for the things I left behind. It sounds like Petty is trying to make things right with his lyrics. In “Coming Home” he sings of redemption and hope for the future. These guys deserve a following, although without national radio play I doubt they will ever get any widespread coverage, and that’s a shame. If you enjoy alt-country bands like Wilco or Old 97’s or just really well-crafted, honest songwriting, then check them out on myspace.com/minibar.